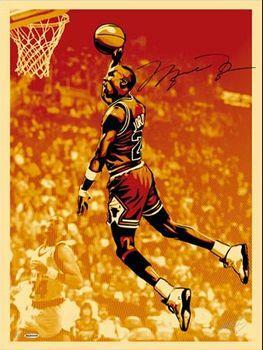 This print is signed by both Michael Jordan and Shepard Fairey. It was initially available only as part of a three-print set with the two other dual signed master prints. The set retailed for $4,499.99 and was available for a limited time beginning 09/17/2009. On 09/22/2009, the individual print became available for purchase, priced at $1,499.99. Both the set and individual print were available exclusively from the Upper Deck Store. From Obeygiant.com: Upper Deck Authenticated Unveils Michael Jordan Hall of Fame Tribute Series from Artist Shepard Fairey Series includes Jordan UNC, BULLS, and Hall of Fame Portrait Prints Everything about Michael Jordan is iconic, from his slam dunks to his signature shoes to his tongue wagging to his number, so he makes a great subject for portraiture because everything about him is laced with cultural significance. You can tell from the look in his eyes, even back when he was at the University of North Carolina, that he was obsessed with greatness, but he also managed to do everything with a sense of flair. I think it’s that combination of intensity and style, and of course his singular talent, that make him the embodiment of a legend. - Shepard “As long time fans of Shepard’s art and having worked with him prior to the popularity and notoriety of his Obama ‘Hope’ artwork, we are very excited to offer collectors of sports memorabilia an art series that will bring to life Jordan’s accomplishments and further cement his legacy,“ said Chuck Donato, business manager of UDA, the Upper Deck Company’s memorabilia division. “Jordan is the sporting world’s ultimate icon and there isn’t a more relevant or iconic artist currently than Shepard, so this is an epic pairing of athlete and artist. We couldn’t be more thrilled.” From the Upper Deck Store: Together with acclaimed artist Shepard Fairey, Upper Deck presents this specially commissioned artwork featuring 2009 Hall of Famer Michael Jordan. Shepard, who is known for creative street art campaigns and iconic pieces of work (like his memorable “HOPE” portrait of President Barack Obama), has now added Michael Jordan to his select list of subjects. M.J. is depicted during his time at North Carolina, with the Chicago Bulls, and in a portrait shot, respectively.